So go ahead and take inspiration from any of these 10 SEO Proposal Templates/Pitch Decks. PandaDoc’s SEO Proposal Template This is a Proposal creator where we just edit the template and send it to the customer to sign the agreement. Read more on this below. Webris’s Seo Proposal Template A PPT format template, which goes great with details of what is offered as service and educates the customer on how it is done. Read more on this below. Bidsketch’s SEO Proposal Template A genuine proposal which can be used by their platform of can be used by a word doc. Read more on this below. 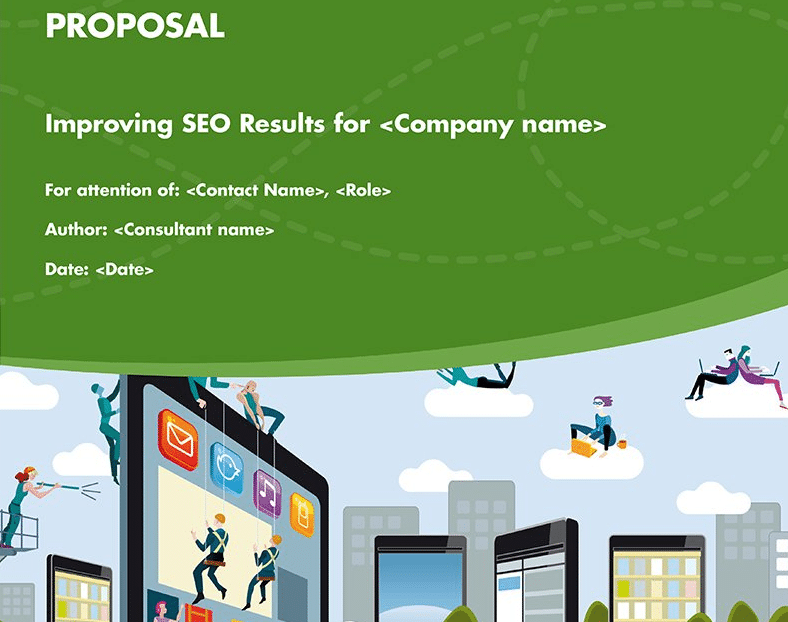 Proposify’s SEO Proposal Template Another proposal with lot many options to choose in terms of template. Read more on this below. Glendemands’s SEO Proposal Template Mondovo’s Inspirational proposal minus the usage of tool’s statistics. Read more on this below. Smart Insights’s SEO Proposal Template This proposal is part of an entire SEO tool Kit which will educate you about SEO and how to approach your client. Read more below. Most simplest SEO Proposal template in the market. Read more on this below. This Proposal includes beneficial info for potential clients to help them realize the importance of proper SEO. This is an easy-to-edit template, with a sidebar that lists all the options. You can edit and customize the template, as well as add images, videos, and pricing tables. You also have the option of adding a different theme to the template – to go with your SEO firm’s branding. In addition to this SEO proposal, PandaDoc provides quality templates for contracts, quotes, and other business documents. They offer a complete solution for all your document needs. The only drawback is that this is not a free service. You will need to choose from one of three pricing plans. You can get started with a 14-day free trial, though. After the trial ends, you’ll need to choose between Professional, Business, and Enterprise plans. The Professional plan allows you to use up to 5 templates. For unlimited templates, you’ll need to opt for either the Business plan or the Enterprise plan. All three plans allow you to create unlimited documents. Overall, the PandaDoc SEO proposal is well-structured and easy to edit. You can customize it to meet your needs and should be able to attract clients with this proposal. 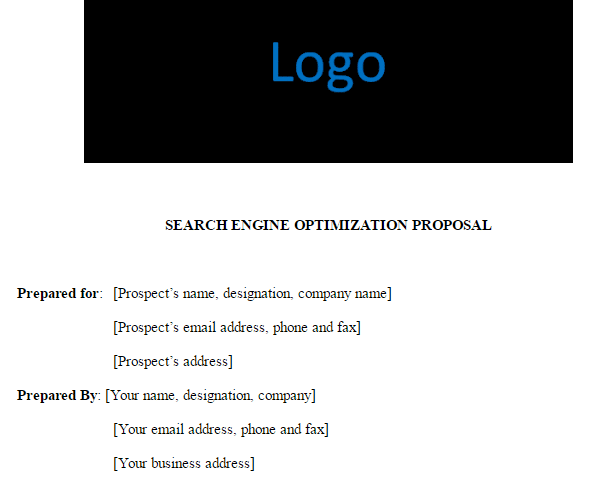 The Proposable SEO proposal template is another custom template with a sleek, professional look. You’ll definitely be able to grab the attention of potential clients with this proposal – and it includes the options to deliver the proposal electronically via a web link. You can easily edit any section of the template and use your own images. The content of the proposal lays out some of the main benefits of working with an SEO firm. It also includes a pricing table and details of an SEO agreement. Proposable also offers other document templates. But, they require users to create an account and choose a payment plan, after a 14-day free trial. Though the prices are similar to PandaDoc, unlike PandaDoc, Proposable offers unlimited proposals with any of their plans. Proposable does a good job of offering a variety of templates, with reasonable pricing plans. Some of their templates are a little plain-looking, but you don’t always want to be too flashy. If you want a simple template that you can quickly edit and send, Proposable is a good choice. This proposal has step-by-step details on why we include what we include. The main advantage of this template is that you don’t have to pay to use it. But, you’ll need to download the template and edit it on your computer. This site doesn’t have an editable template that you can edit in your web browser and immediately send to your potential clients. You essentially have access to an informative blog post with a template that you can copy and make into your own proposal. The creator has made the proposal as a Microsoft PowerPoint presentation. They feel that this does a better job of creating a clean design that should appeal to clients. But, you may be restricting your target audience by using a PowerPoint document for your proposal as not many would be keen on using a PowerPoint proposal. The costing is not included but we assume it is to be included by you on what you charge. Link Building: What Do We Look For? Bidsketch is another paid service that gives access to professional-looking proposal templates. In addition to SEO proposals, you can create web design and freelance proposals. If you don’t want to sign up, you could download the proposal document folder through email and edit the section. Bidsketch claims that you can turn 18% more of your leads into clients with these templates. Looking at their samples, this could be true. The templates have a clean design. When you finish creating your proposal, you can view and export the document as a PDF. You can even edit your own custom HTML and CSS. You have complete control over the final look of the proposal. Bidsketch also allows you to host the documents in the cloud. After you’ve electronically sent the proposal, your clients can sign the document electronically and send it back. The only disadvantage to this is the cost. But, it is comparable to the other paid templates discussed. You can either go for solo, team or business plans. A free 14-day trial is also available. Download or sign up for the proposal builder and edit your details. When you download the whole package, you get Sample Proposal Template, Retainer Proposal Template, SEO Proposal ebook, SEO Proposal Worksheet, and SEO Proposal Guide. Know Exactly When Your Proposal Gets Viewed if sent through the platform. Send it via email and get instant approvals with electronic signatures using their builder. 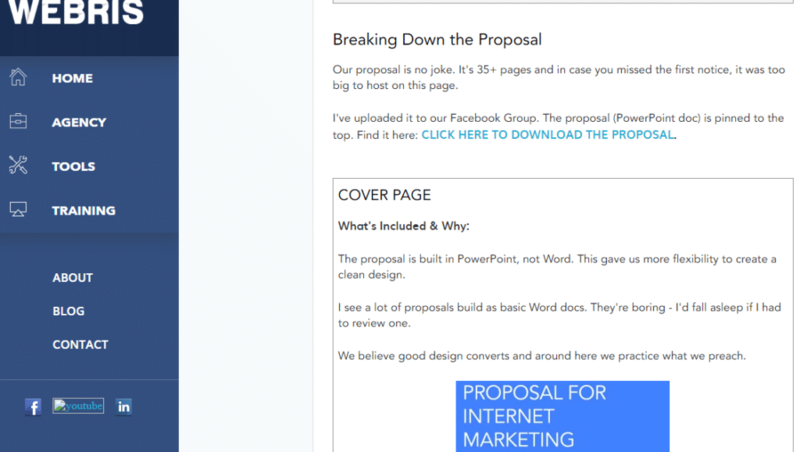 Proposify is a paid proposal template service. They offer a unique set of features. Instead of offering a specific number of proposal templates per month, you can manage 5 active proposals at a time with their basic or ‘tall’ plan. There is a “grande” plan that allows up to 25 proposals, along with a couple of other plans with added features. Proposify’s SEO templates help you pitch SEO services by educating clients on the importance of on-page ranking, content creation, and other SEO strategies. The template is completely customizable. Edit any of the fields, add your images and choose a color theme to match your existing brand styles. Of course, you can create more than just SEO proposals. You can create documents for marketing, AdWords proposals, accounting proposals, and more. There are no drawbacks to using Proposify. You get access to a variety of high-converting templates for all your document needs, including SEO proposals. In the end, Proposify is one of the most affordable options, given the number of documents you can create. For a small SEO agency, this should meet your needs and boost your conversions. Getting the lay of the land? This is a shameless plug. But here it is. If you want to make an offer your client can’t refuse then here it is. This is our native Proposal and has been tried and tested with our clients. So far we have an 80% direct conversions on this proposal. The only proposal that includes data and insights inside the proposal to convince the client with the help of Mondovo Toolset. Simple and easy instructions on every section of the proposal are provided with suggestions and techniques that you can use. Even if you don’t use this template, you can gain valuable insight into what it takes to craft a successful proposal. If you don’t want to spend money on a paid service, this is a great way to start creating your own proposals. This proposal is re-crafted by taking the best points of all the working proposal and also by including the data and insights from the SEO tool which is very convincing to grab any deal you want. Download the Template and follow the simple instructions in it. 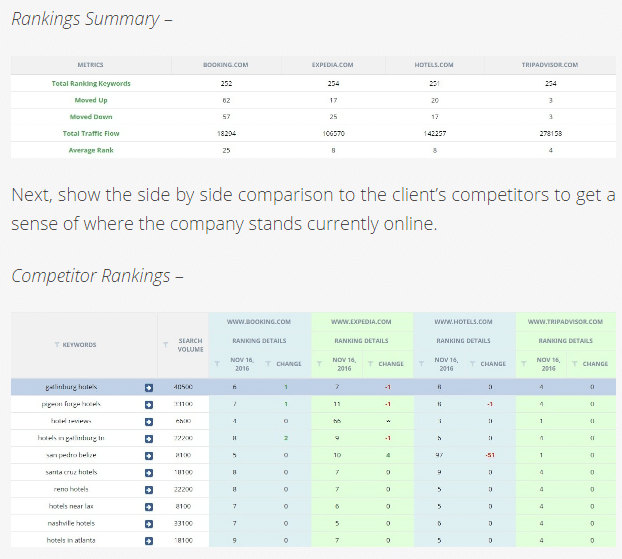 Create an account with Mondovo to run the reports you require for the proposal and add insights about your client and their competitors inside the template. Send it over email and win all your deals. This template is similar to that of Mondovo, minus the screenshots and usage of the Mondovo tool in it. The Glendemands SEO proposal template walks you through the process of creating an exceptional SEO proposal. The author does a great job of explaining all the components that go into a quality proposal, including an executive summary, competitor analysis, and an explanation of standard SEO services. The template is available as a downloadable Word document. So, you will need to edit the document on your computer. Again, if you just need one proposal, this is a good way to get started. Make sure that you read the entire blog post, as the author doles out important suggestions, and covers some of the main points that you’ll want to include in your proposal. If you just want a template that you can quickly edit and email to your potential clients, then this could be it. Email your prospects and win the deal. The Smart Insights SEO proposal template is actually part of a complete SEO toolkit. This is a complete solution for planning, managing, and optimizing all of your marketing campaigns – including the proposals that you send out to your clients. So, in order to use the template, you’ll need to purchase the toolkit. You can get instant access by paying for a membership. There is a basic membership and an enterprise membership. Once you sign up, you can access the template, along with all the free resources that are provided to members. These resources help you create better proposals, while also providing suggestions to improve other areas of your business. Smart Insights knows that you’ll enjoy the toolkit. They back this with a 30-day money back guarantee. If you’re not happy with the results, they will refund you the cost of the toolkit. The best looking PPT presentation to submit your proposal. Easy to download as a PPT file, edit it directly using SEO Monitor tool info. The template includes tactics that are known to work. They have been used by SEO agencies to boost conversions. It also includes tips to help you stand out from other SEO agencies and freelancers. There is no membership or monthly fee. You can simply download the document and then begin editing. If you believe that a good looking PPT proposal will win you a deal then this is the one to choose. This isn’t an SEO proposal template per se but an instructive blog that you can use to craft your proposal. Crafted in the form of a witty blog post for you to read, copy the format and paste your own content. Can be used in an email body directly. If you’re new to creating proposals, this may not be your best solution. The author doesn’t provide a lot of background on what to include and there are no design elements. So, why would you use the Portent template? If you want a simple outline for an email blast to send to your mailing list, this is a good option. You can easily make a short, concise proposal to help attract the attention of potential clients. Edit the proposal and send it over email directly. That covers the top 10 SEO proposals/Sales Pitch Decks you can use to convert your leads. These templates are used on a regular basis by successful SEO agencies. And now, you can use them too. However, if you want to build a custom proposal from scratch then below is a compilation of all the items that the all proposals above include. You may include all or some of these sections to make your version of a killer SEO proposal. Go ahead and create the most powerful SEO Proposal ever created. Content that you could use for your ultimate SEO Proposal goes here. thanks for the great list! helped me a lot! 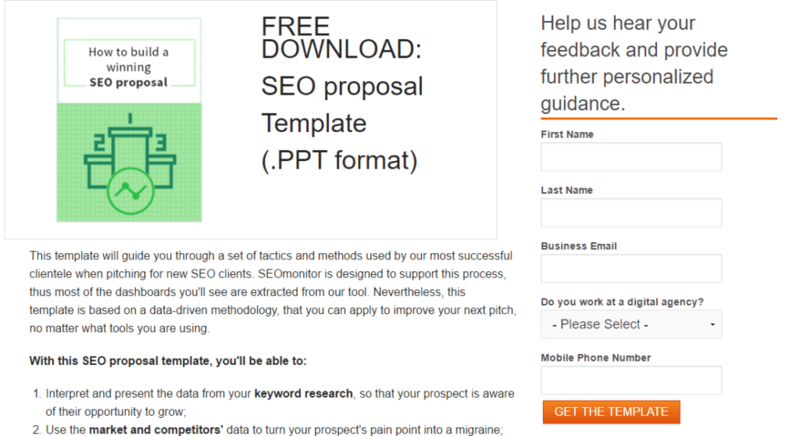 Excellent write up on SEO Proposal Templates & Sales Pitch Decks! Another thing to consider for lead generation is getting page one rankings on Google and YouTube with videos. It can drive tons of targeted traffic to your site(s). In this post you have provided us some interesting message about top 10 SEO proposal. It’s really a useful post for us. I am very thankful for this amazing post. Thanks for sharing this post. This is really helpful and I am sure I am going to put this in use. Nice article. short&sweet. Imp points discussed. Article flow nice, font used good and really attract. Made me more interested in the topic, really great & nice…do write more and impress..